American has been busy the last couple of months fitting many of their 767-300s and 757s with new Main Cabin Extra seating that offers passengers more legroom in coach. Because it’s been a work in progress, there’s been no way to know whether or not your flight would offer Main Cabin Extra. American hasn’t been displaying or selling these new seats, whether or not you’ve ended up with more legroom has just come down to luck. Apparently they’ve made a lot of progress reconfiguring planes, and it seems that within the last few days they’ve quietly launched their new economy plus product. Yesterday I noticed that one of my upcoming flights now shows me sitting in a Main Cabin Extra seat (it wasn’t that way last week, I swear!). So if you’re traveling soon, you might want to take a look at your own reservations: you might be able to get a seat that offers you more legroom! By the way, if you’re curious, MiamiBeach, a member from the Traveling Better Forums, posted some photos in a thread, go here to see them. AAdvantage Executive Platinum, AAdvantage Platinum, oneworld Emerald and Sapphire, and customers who have purchased a full-fare Main Cabin ticket receive advance complimentary access to Main Cabin Extra seats. To celebrate the launch of this new seating product, AAdvantage Gold and oneworld Ruby members will also have complimentary access to Main Cabin Extra seats through December 31, 2013. Elite status members also continue to receive PriorityAAccessSM boarding as part of your benefits. Preferred Seats will continue to be complimentary for all of our AAdvantage elite status customers and their oneworld equivalents, as well as customers who have purchased a full-fare Main Cabin ticket. Main Cabin Extra and Preferred Seats can be selected at the time of booking up until check-in. You can purchase Main Cabin Extra seats, which also comes with Group 1 boarding privileges, when you book your flight on AA.com, up until the airport check-in cut-off time and prices range between $8 and $118 per flight. Main Cabin Extra seats can also be purchased through airport self-service machines, AA Reservations, and through select travel agencies. Safe travels and I hope you have a great Thanksgiving! It’s interesting how much space is left behind row 13 in the pictures. You’d think that they could have made the seats even roomier, but I suppose people would have trouble reaching their tray tables. Row 11 bulkhead looks like a great alternative to the exit rows. 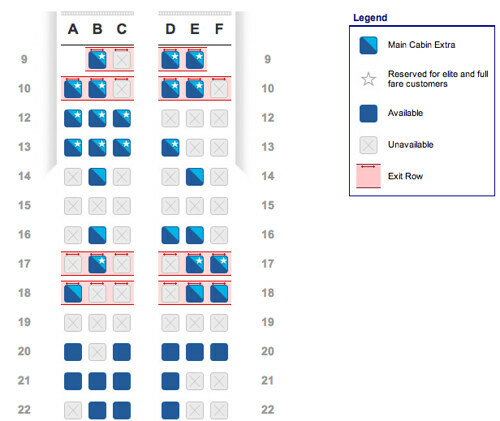 @ John777 – You’re right, and because the seats recline I think I’d actually choose row 11 over exit row 20. I am flying LHR-DFW this Saturday just went and checked and my flight has Main Cabin Extra, switched seats – free for me as I am AA Gold – with Double Points/Miles too – what a win! @ David F. – Woo hoo! The extra legroom makes a big difference on a long flight like DFW -LHR, glad you got the seat! Please do report back and tell me what you think. Take a photo or two if you can. Hope you have a great trip! I am in row 10 of MCE right now on flight 637 ORD-FLL serviced by a 737. @ Avi – Wow, I didn’t realize that it was already on some of their 737’s too. Nice! So what did you think? Is it worth an extra $25? Snapped up 11H for two trips this past Monday for early December and I had just checked the seat map a couple days earlier and it was definitely not there before! On the 2-3 flight, the extra few inches of legroom (to me) make a big difference. I didn’t pay as an elite which made it all the more sweet. @ Avi – Thanks for the review, I can’t wait to try it! I think I got screwed by this change on CDG-DFW yesterday. Wife and I got switched from 12A/B that I had reserved since Jan this year to 24A/B. Specifically chose 12 for smaller area and quieter with power port. I sent AA an email complaining about this and will see what they will do to compensate. I’m lifetime gold so I don’t get why our seats were swapped. Am in the MCE on a DFW-HNL in a couple of months. Has anyone flown these seats on the 767-300? SEND THE PICTURES! @ Jimbo – HNL is a great place for a winter break! Here’s a newer post with some photos of MCE seats in the mini-cabin section of the 767-300. Have fun in Hawaii! Flew 767 CDG-ORD Seat 11B. Given the chance, I would not fly in Row 11 again. Hate those arm rests and the tray tables. Also, typical of bulkhead, no under seat stowage and was left storing by bag in Business class. So, would not rate Row 11 as a great improvement over most exit seats. 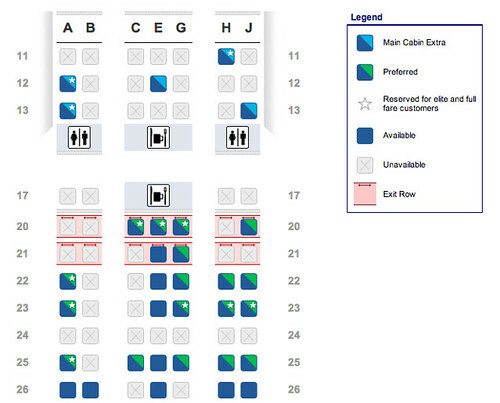 Would go for Row 13 or 12 to get a regular tray table and under the seat room for a bag. The extra leg room was very nice though and is quite an improvement. Definitely worth an extra few $$$ on a long-haul. Thanks for the photos, aadvantagegeek. These look great for a routine coach ticket. @ Jimbo – No baked on board chocolate chip cookies, but they look like great seats:-) Thanks for reading and for the comment! Flying with Family to Paris on a 763 aircraft with MCE. Called AA and had her confirm to me that these seats in MCE have same leg room as an exit aisle would and she said yes. I’ll be in row 13 and coming back on 12…will see if we like it. Thanks for all your reports on this as I was unaware until I decided to search for feedback and the pictures helped a great deal !!! I am 6’4″ and traveling with my wife from Rome to Chicago on a 767. Currently, we are sitting in MCE in bulkead Seats 11 H & J. Do you think there is more leg room vs. if I sat Exit Row in 21 in the middle seats C, E? I appreciate any insight. @ sliza33 – That’s a great question. 1) MCE offers a lot of legroom, even the bulkhead row: there’s very little difference between MCE and the exit row on the 767-300. 2) When American installed Main Cabin Extra on their 767-300s they configured them using wider, 777-200 seats in the MCE sections. Both the bulkhead MCE seats on row 11 and the exit row seats on row 21 have the tray in the armrest, so the’ll have reduced width. With the wider 777 MCE seat it will be much less noticeable. Those 767 exit row seats feel really tight. 3) The MCE mini cabin is separated from the rest of the main cabin, and because of that it feels less dense and cramped. You’re also sharing the overhead storage space with fewer people. I hope that helps. Let me know what you decide to do and feel free to come back and share your review of the MCE seats. Have fun in Rome and safe travels!! Has anyone flown the 757 MCE seats HNL LAX? If so, would you choose exit row seats over regular MCE seats? Thx ! @ Marcy – Both MCE and Exit Rows on the 757 have their advantages and disadvantages, so there’s not really a right choice, but if you know the pros and cons you can make a choice that’s right for you. The legroom is the same, but these are some differences for you to consider. The first row of exit row seating doesn’t recline. The second row of exit row seats does recline, and because the exit row in front of you can’t, you won’t have to worry about the person in front of you reclining their seat and resting their head in your lap. The arm rest is fixed, so even if the seat next to you is open, you can’t raise the arm rest. The seat is narrower than a standard seat due to the tray being located in the arm rest. The seats recline, so despite the extra room, if the person in front of you reclines their seat all the way back, it may annoy you. The seats are wider than exit row seats due to the seatback tray. If you’re in the bulkhead of MCE you won’t have to worry about the person in front you reclining their seat. If you’re in the bulkhead of MCE your tray is located in the arm rest, so your seat has less width than other MCE seats. The armrest are moveable, so if you have an empty seat next to you you’ll be able to raise the armrest and enjoy the extra room. Day flight: I’d probably pick a seat on the second exit row. I’d probably spend most of the time watching movies on my iPad or working on my laptop, so I’d be okay with giving up the extra width for not having the person in front of me recline their seat. Overnight Red-eye Flight: I’d pick MCE. The wider seat and the possibility of being able to lift the armrest will help me sleep on the flight. And since I’m going to be reclined most of the flight, I won’t be bothered by the person in front of me reclining their seat. I have a flight booked from Los Angeles to Barcelona I have 13G both ways. It looks like lots of leg room no one behind me. Just a little worried if the bathroom will smell??? ?